So much time and hard work goes into picking out the perfect engagement ring and planning the proposal, but what about the wedding rings? 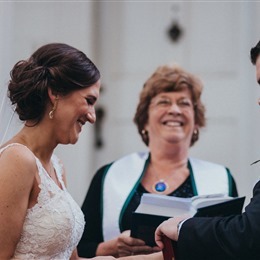 Whether the bride and groom plan to pick out their wedding bands together or shop for them separately, there are many things to consider before you purchase the rings. Similar to picking out an engagement ring, you have to consider your budget and your significant other’s taste. The bride-to-be’s wedding ring should match the engagement ring she’s already wearing. Some grooms might even purchase both rings together as they sometimes come in stackable packages. Several ongoing engagement ring trends are always trending for wedding rings. Classic and rose gold, brilliant diamonds, and vintage or delicate settings will always be trending. Some newer trends hitting the market this year include stackable rings, twisted bands, and colored or floral accents. Your significant other is guaranteed to be pleased with any of these top wedding ring trends. Gold wedding bands are always trending. Choose a classic yellow gold or white gold depending on what color gold your engagement ring is. You always want your engagement and wedding rings to match. A simple gold band always pairs beautifully with any engagement ring from the simplest to the most elaborate. This is a classic choice that every bride and groom will love. 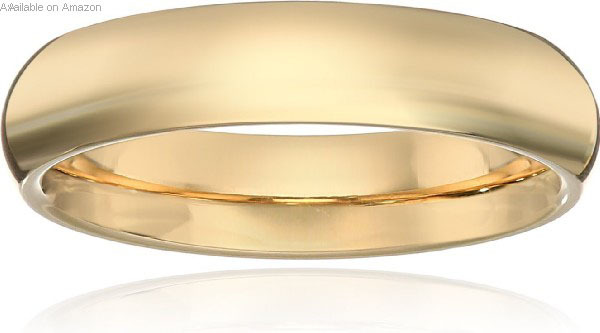 Classic Fit Gold Wedding Band: If you’re thinking about going with a classic gold wedding ring, try this band offered in yellow and white gold. It’s a traditional, brightly polished wedding band made of 10k gold with a slightly rounded shape for the bride who likes a simple and classic look. Pink was the Pantone color of the year for 2016, making rose gold a popular choice in jewelry and wedding rings. The pink gold color will continue trending in 2017 because its feminine rose shade flatters all skin tones and makes for a beautiful gold alternative away from traditional yellow or white gold. If your bride-to-be loved her rose gold engagement ring, then buy her the perfect rose gold wedding ring to match! Stacked wedding rings are a popular trend this year, especially among boho brides. Instagram and Pinterest are full of feeds with stacked rings in pairs, trios, and even quadruples. It provides a little extra sparkle, a vintage feel, and a beautiful design new to the wedding industry. Try stacked rings in the same gold color or a triplet of rose, white, and yellow gold rings. The options are endless for stacking wedding bands. For the bride who loves diamonds, buy her a diamond wedding band to match her diamond engagement ring. Sparkling diamonds are a classic wedding ring choice. Your bride’s ring will stand out, always catching her eye with its sparkle to remind her of all of the best things about your relationship. Straight Diamond Ring Band: This classic diamond stackable wedding band is handcrafted from shiny 18-karat gold for the perfect match to a diamond engagement ring. Twisted bands provide the romantic feel of intertwining your love forever. This trend is symbolic and stunning, representing two lives coming together as one. Opting for a twisted band gives your ring a new dimension and provides a beautiful complement to an engagement ring with a simpler setting. Choose a classic gold twisted band or a twisted band of tiny diamonds. Any setting will look beautiful with this trending wedding ring design. Engagement rings with delicate settings are a popular choice, but these beautiful details also look wonderful on wedding bands. For the bride who appreciates the tiny details, a wedding band with delicate settings is a great choice. Choose a wedding ring with intricate patterns, tiny diamonds or colored stones, and any other details that will match her engagement ring beautifully. 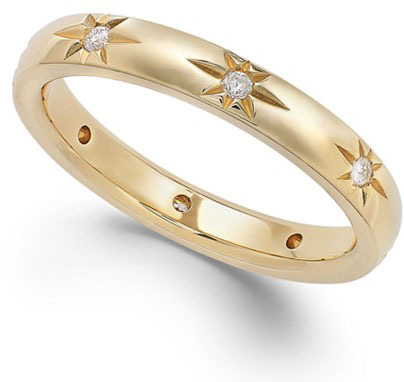 Diamond Star Wedding Band: This diamond star wedding band in 18k yellow gold features a polished band with etched star accents emblazoned with small full-cut diamonds in the middle. It’s a unique wedding ring choice that your bride will love. Colored ring accents were trending for 2016 and are predicted to continue trending next year too. Your colored accent can be colored stones instead of diamonds or a pattern of alternating diamonds and colored accents. Emeralds and pink diamonds are some of the most popular color choices for wedding rings if you’re opting away from traditional diamonds. Take advantage of this fun trend and add a pop of color to the traditional wedding band. You can pair a colorful wedding ring accent with a colorful engagement ring or use it to add some color to a traditional diamond engagement ring. Vintage has always been a major wedding trend when it comes to engagement rings and wedding gowns. If your bride loves vintage style, pair a vintage engagement ring with a Victorian-inspired wedding band. 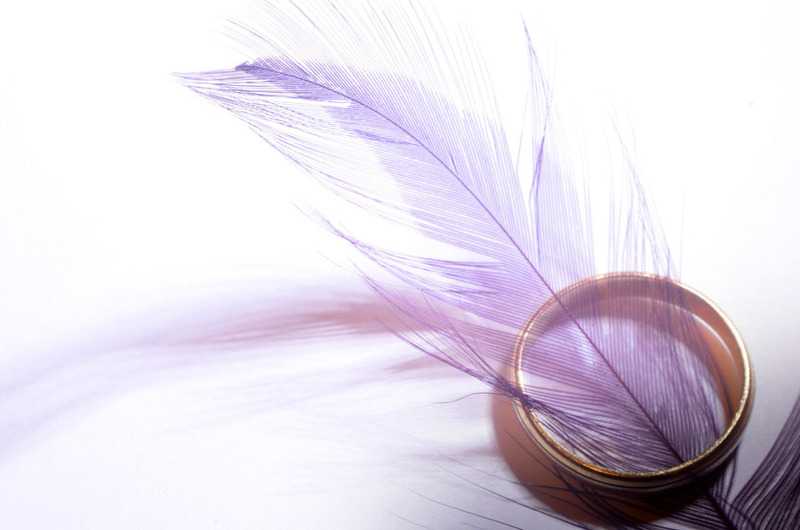 The heirloom quality of vintage wedding rings is glamorous and timeless, perfect for any bride. Start with this list of top wedding jewelers near you. Delicate engagement rings are classically feminine with smaller stones set in simple settings for the perfectly dainty bride. There’s no need to shell out for giant diamonds and over-the-top settings if that isn’t the right style for your bride. If you chose a delicate engagement ring, then be sure to choose a wedding ring to match. 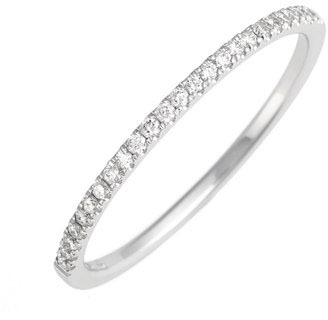 Go with a thin band, classic white gold, and tiny diamonds if you want to add a little extra sparkle. The wedding industry is blooming with floral trends for everything from wedding gowns to bridesmaid dresses to engagement and wedding rings. Floral-inspired halos make for an ultra-feminine engagement ring and paired with a floral accented wedding band, creates a whimsical bridal look. For floral accents, look for a twisted wedding band with tiny flower detailing or a band with tiny diamonds and floral halos. If you’ve already picked out the perfect engagement ring, experienced a wonderful wedding proposal, and are now planning your special day, it’s time to pick out wedding rings! Start with this list of top wedding jewelers near you. Look through the photos each vendor has posted in their profile (you can bet those will be the best ones they have to offer!) and save a few good options. Make a decision with your significant other whether you’ll purchase your wedding bands together or separately, and decide on some important details like what your budgets will be and what kind of wedding rings you want. Always consider what kind of engagement ring the bride-to-be is already wearing and purchase a matching wedding band since she’ll be wearing them both together for many years to come. If you’re not sure what your options for wedding rings will be, consider a few trends from traditional gold and diamonds to newer trends like floral accents or twisted bands and stackable rings. Any of the top trends on this list will be sure to blow your significant other away when it’s time to exchange rings at your wedding ceremony.